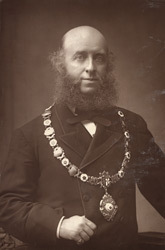 Portrait of the President of the Birmingham Photographic Society, and Mayor of Sutton J. B. Stone, J.P., F.L.S., F.G.S. "Mr. Stone has for many years taken a great interest in Photography, and at the present time is interesting himself very actively in the promotion of the scheme laid down by Mr. W. Jerome Harrison, F.G.S., for a photographic survey of the county of Warwickshire. Particulars of the scheme are given in the REPORTER for December 31st. As far back as 1869 Mr. Stone published an admirable history of Lichfield Cathedral, illustrated with photographs printed from negatives taken; it will be therefore understood that his is no 'prentice hand. Under his presidency the Birmingham Society is certain to advance."